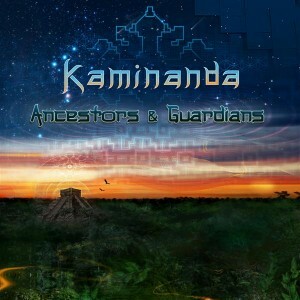 Merkaba Music presents Ancestors & Guardians, the fourth studio album by Kaminanda, a downtempo and tribal fusion artist based in California. Returning to the evocative soundscapes heard on Gateways Of Consciousness, Kaminanda draws us deeper into his labyrinth of sound with just the right combination of womp, glitch, and groove. All tracks written and produced by Kaminanda. Violin on Moonlight Tango by Nathaniel Markman; guitar on Liberation by Kaminanda; didgeridoo on The Great Alignment by Kaminanda; vocals on The Great Alignment by Eliza Moon; vocals on The Great Alignment by Atreyu; vocal samples on Time Travellers by Michael Bernard Beckwith. Masterered by AMB Mastering with artwork by Totemical and logo by Mugwort Designs. MP3 Download | FLAC Download | WAV Download · Download count: 17,275. AW YEAH. Really loved the previous Kaminanda stuff. So happy. Very cool stuff! Nice to see some interesting music coming out from a fellow Californian!! “Alchemy Resonance” is excellent, best track on the album. As C-C said, “You can’t go wrong with Kaminanda”, have had this album in my collection since last year and it gets a lot of play – though, that said, “Gateways Of Consciousness” is Kaminanda at his absolute best, do not miss that one! Love it! kaminanda is a favorite. Hey dude thanks for your perfect music, its allways chillin and deep music on a fantstic producer level! Instant classic. Dude just gets better and better. awesome music guys, thanks a lot! Du très lourd la ! c’est du très bon boulot !!! !